Witnesses say the man leaned over to pick something up from the ground. When it exploded, he was rushed to the hospital, where he died. It sounds like an urban legend: A 60-year-old man bent to pick something up outside a subway station in Stockholm. It exploded, blowing up his hand and killing him. 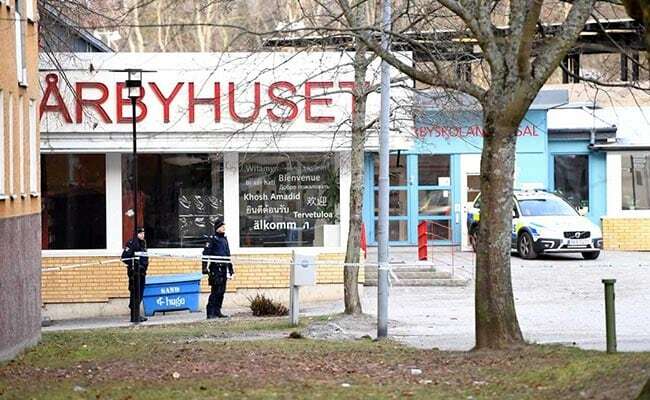 But Swedish police say that's exactly what happened Sunday morning outside the Varby Gard subway station in Huddinge, a suburb to the city's south. A woman in her mid-40s was injured in the blast. Police say she suffered minor wounds to the face and legs. Police can't say for sure what the device was or why it exploded. Rescue official Lars-Ake Stevelind told the Swedish broadcaster SVT that "someone has used some type of explosive material" for the object. The Aftonbladet and Expressen tabloids claimed that it was a hand grenade, but police spokesman Sven-Erik Olsson dismissed that as speculation, according to the Associated Press. Police say that they don't believe terrorism is to blame or that the victims was targeted. For now, the station is cordoned off, as officials sweep the area for any other possible explosives. They are also carefully reviewing security camera footage. This is just the latest mysterious explosion in Sweden. In October, bombs were detonated across the country. Explosions went off in at least two apartment buildings in Malmo. A hand grenade was tossed into a nightclub in Angelholm, which injured at least one person. A powerful blast ripped the entrance off a police station. The doorway was laced with dynamite so powerful that it blew a chunk of rubble more than 250 feet away, into the living room of someone's home. Police attributed the attack to "criminal circles." Bomb scares and threats are becoming more common, too. In the United States, right-wing outlets such as Infowars and Breitbart have cited the explosions as evidence that President Donald Trump is right in concluding that more open immigration policies mean more crime. But local outlets say there's another explanation. According to the Local, "Explosives are often used by organized crime rings in Sweden, especially in the south where settling of scores and intimidation are frequent among drug traffickers. Police and judges are also regularly targeted."